901-four 88-7629 This scooter has been garage kept, motor was built by local HD in 2001and bottom rebuilt, at 50k top end gaskets replaced at 54k, now has 62k on odometer. edelbrock performer heads, stage 2 cams, mukuni carb, HP ignition and coil , chrome Bolt covers, Primary cover, side covers, rocker boxes, forks, ( not sliders). Heritage soft-tail Handle bars. 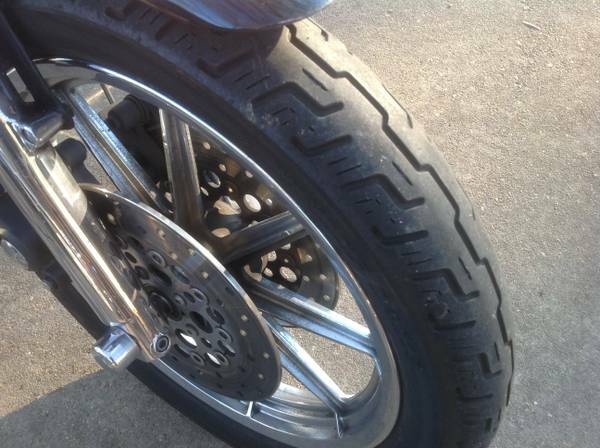 Rear tire replaced in aug 2013, frt. tires replaced in sept 2013. Only reason I'm selling, I had to have a Bagger. It does need fork seals ,light leak I do not need help selling. I will only response to phone calls. So don't text or email. To much BS on Craig's list. Will not sell by pay pal. He's not my Pal. Bought a Bagger, ask for Slingshot. Saddle bags in pix do not go.